Be The Straw: "Even the Rich Are Hungry for Love..."
"Even the Rich Are Hungry for Love..."
The first football jersey I ever owned was that of Junior Seau's. Admittedly, news of Junior's death - an apparent suicide - has rocked me. Even before I understood the intricacies of football, I looked up to Junior - his work ethic, his humility, and his passion were an inspiration. He was a role model. As children, we often think our role models are invincible. They are not. "Superman is dead," said Shawn Mitchell, a chaplain for the San Diego Chargers. "All of us can appear to be super, but all of us need to reach out and find support when we're hurting." Sometimes we might dream of having a celebrity lifestyle. I know I did. Money, fame, power, success, all are so very tempting. From an early age we are trained to value these temporal treasures. We often forget that none of these things provide genuine happiness. How many stories of celebrity tragedy must we encounter before we really get it? Junior was a celebrity - especially amongst football fans and in the San Diego community. By many accounts, Junior had it all. He had a legendary football career, his successful restaurant in San Diego is a popular eatery, and he almost certainly will be a first-ballot Hall of Fame inductee. The question is what could have caused him to take his own life? Now, I can't venture a guess as to what demons or struggles Junior Seau was battling, and maybe no one can, but there must have been something that he lacked if he took his own life. Who knows? But I am reminded of these sobering words from Blessed Mother Teresa: "Even the rich are hungry for love, for being cared for, for being wanted." I'm not sure what else there is to say for now. I'm still processing this whole thing. I guess it is just a reminder that the world needs love, y'all. May we all do our part in spreading it. Let those you care about know you love them, and let those in your life know when you are hurting. 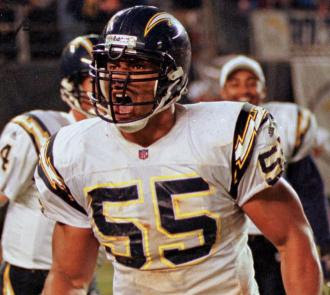 Requiescat In Pace, Junior Seau.